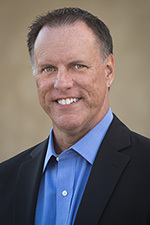 DNS | Richard M. Hicks Consulting, Inc. This web site is primarily dedicated to installing, configuring, managing, and troubleshooting DirectAccess on Windows Server 2012 R2 and Windows Server 2016. However, there’s little documentation on how to properly uninstall and remove DirectAccess. This post provides guidance for gracefully uninstalling and removing DirectAccess after it has been deployed. It is recommended that all clients be deprovisioned prior to decommissioning a DirectAccess deployment. 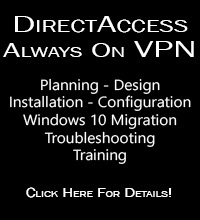 This is especially true if the Network Location Server (NLS) is hosted on the DirectAccess server itself. 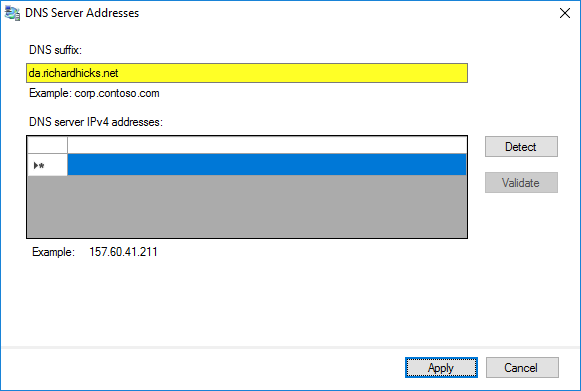 Remove all client computers from the DirectAccess client security group or unlink DirectAccess client settings GPOs (but don’t delete them!) from any OUs where they are applied. Allow sufficient time for all clients to process security group membership changes and update group policy before uninstalling DirectAccess. 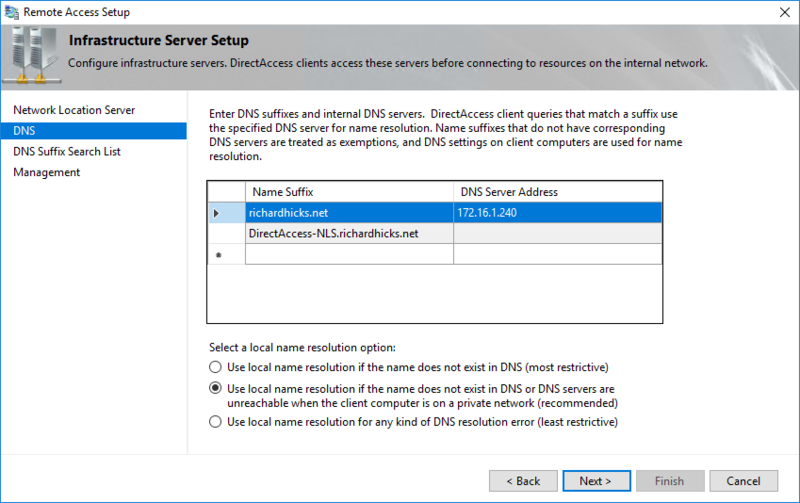 If the NLS is installed separate from the DirectAccess server, it is recommended that it remain online for a period of time after DirectAccess has been decommissioned. Clients will be unable to access local resources if they still have DirectAccess client settings applied and the NLS is offline. Keeping the NLS online prevents this from happening. If this does happen, you’ll need to delete the Name Resolution Policy Table (NRPT) on the client to restore connectivity. To do this, run the following command in an elevated PowerShell command window and restart the computer. 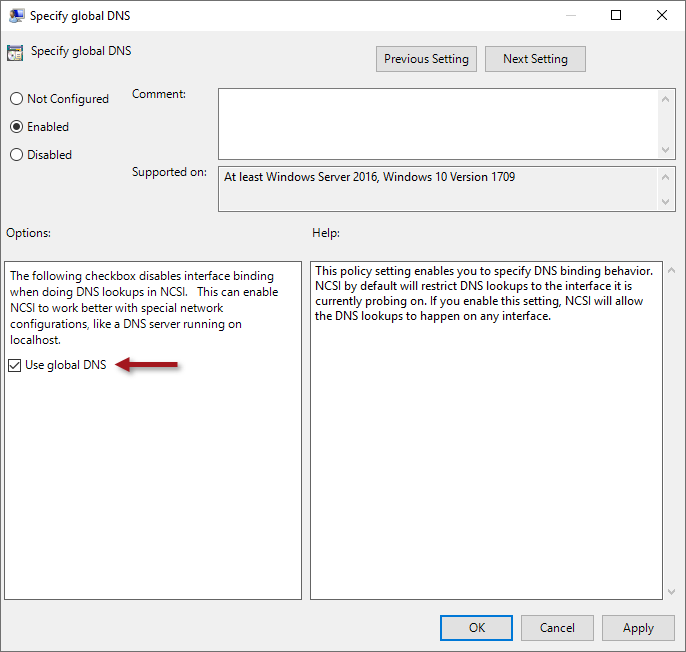 It is not recommended to decommission DirectAccess by simply turning off all DirectAccess servers and manually deleting all of the associated group policy objects (GPOs) in Active Directory. 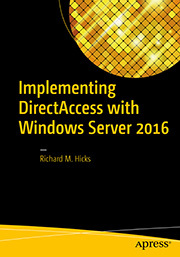 A better way is to gracefully remove DirectAccess using the GUI or PowerShell. 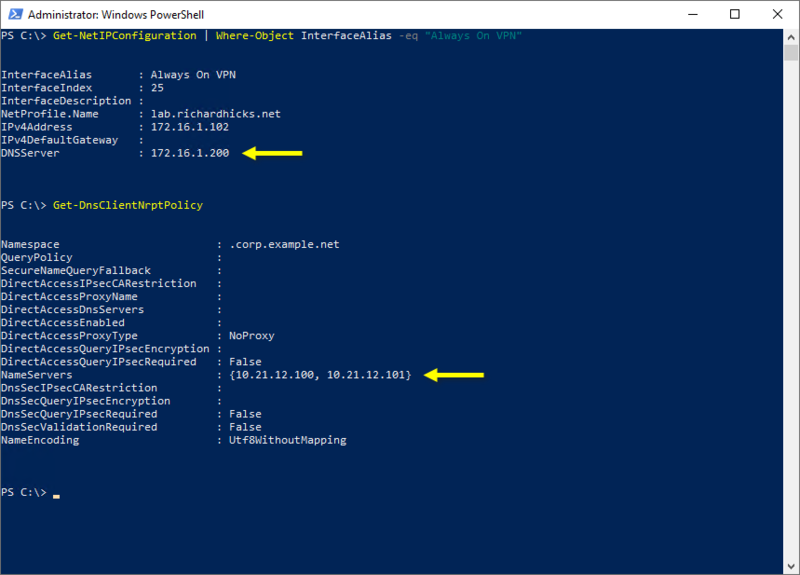 To uninstall DirectAccess using the GUI, open the Remote Access Management console, highlight DirectAccess and VPN, and then click Remove Configuration Settings in the Tasks pane. 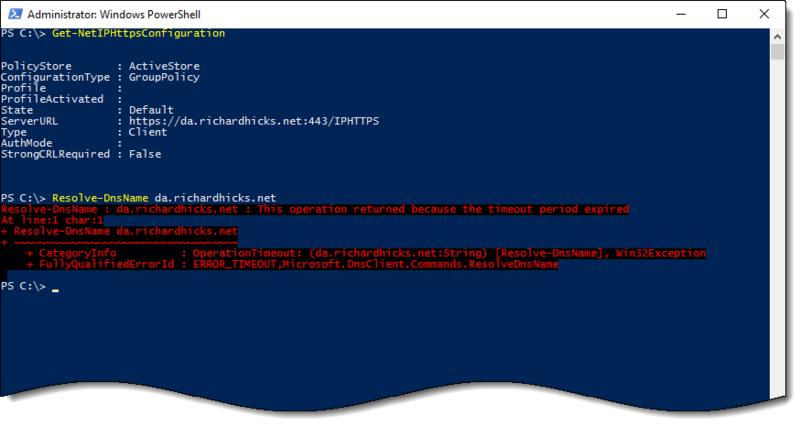 Alternatively, DirectAccess can be removed by running the following command in an elevated PowerShell command window.